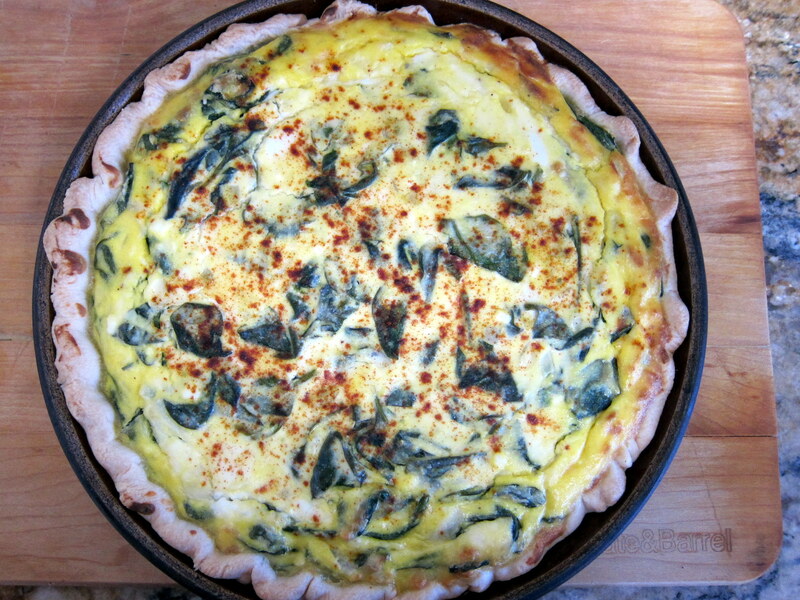 This spinach ricotta pie comes from my mother’s collection of Pennsylvania Dutch recipes. From its pristine condition, I doubt she ever made this pie. Like many of us home cooks, she had a large file of must-try-this-sometime. I played with the preparation instructions, added lemon zest and nutmeg, and decided to use Gruyère instead of the “sharp cheese” listed in the ingredients. I baked it in my Mom’s pie plate that she had owned before I was born, many moons ago. 1. Combine the white and whole wheat flour. 2. Using 2 knives, cut in the butter. Add the buttermilk and form dough into a ball. 3. Chill dough in fridge for 1 hour. 2. In a large skillet, melt the butter over medium heat. Add the onion and cook until limp, about 5 minutes. 3. Add the flour and cook for 2 minutes, coating the onions. Add the spinach and cook, stirring, until spinach is wilted and bright green. 4. Remove pan from heat and add salt and pepper to taste. 5. In a large bowl, beat the eggs slightly. Add ricotta, cheese, sour cream, nutmeg and lemon zest. Mix well and set aside. 6. Remove chilled dough from fridge. Roll out and fit into a 9-inch pie plate. 7. Add the sauteéd spinach-onion mixture to the ricotta filling. Pour the pie filling into the crust. Smooth to even filling. Sprinkle with paprika. 8. Bake 45 minutes. Allow to “rest” 15 minutes before serving. 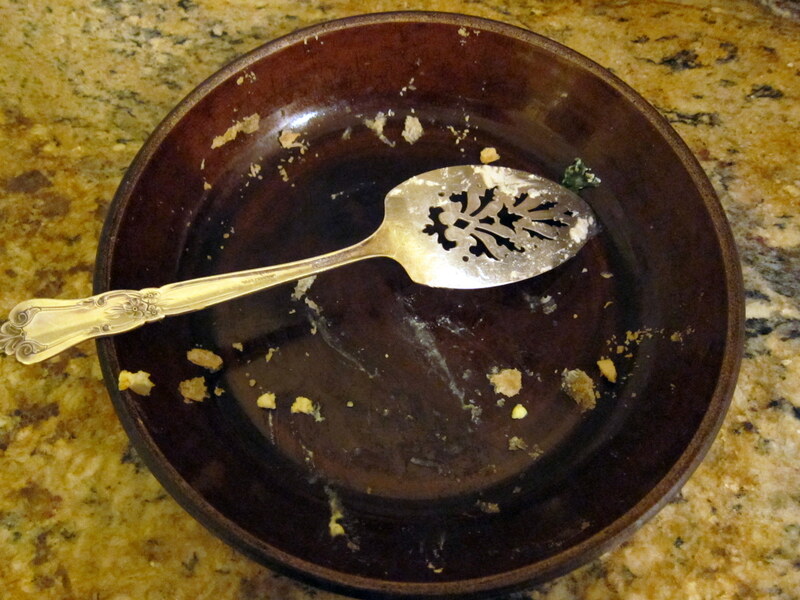 I love the photo of the empty pie plate! This looks delish and will go in my file of must tries–the changes you made to the recipe sound delightful. Thanks, Wendy, so nice to hear from you – miss you on twitter. Business must be doing well, I hope – and here comes jam season. This does look good! Love that you have your Mothers pie plate- such a treasure! My “must try this sometime” folder is way out of control! Hi Jayne, yes, I rarely use her plate for fear of breaking it..And my must-try file is totally out of control as well! I love spinach everything, and this tart sounds great. The gruyere is a nice touch. this look so good, too bad the pie plate is empty or I’d knock on your door and ask for a little bite! Let me know if you try it – it has become a family favorite here – press-in crust from the deli section makes for a quick supper or brunch.